While many of the activities in Teach Me Mommy are geared toward creative arts (painting, sculpting, singing, and so forth), I’ve decided to write a few posts about physical activities that you can do with your preschooler to encourage the development of the grosser parts of life. Of course, by “gross”, I’m referring to gross motor skills or your child’s ability to control his or her own movement. Does she understand simple space directions of forward, backward, up, down, and sideways? Can he walk through an obstacle course and steer himself visually so he avoids running into the obstacles? These are a part of developing total gross motor skills and the first step is body awareness. Body awareness concerns the child’s knowledge of his own body and the body parts. Can the child touch and identify head, eyes, nose, ears, shoulders, arms, elbows, hands, body, chest, legs, knees, ankles, and feet? Does the child have an understanding of two sides of his body, a beginning awareness of right and left? The concepts can be developed with a little help at home. This help does not have to be a highly structured situation. They can be taught as an everyday part of living with just a little effort on the part of Mom and Dad and even older brothers and sisters. When attempting to help your child develop these skills, do your best to avoid becoming overly serious. A light mood, an element of play, add much to the enjoyment of learning&dash;we are not strength training or preparing your child for the Junior Olympics! Have your child raise his arms and swing them in a full circular swing. Encourage the movement to come from the shoulder keeping the elbows as straight as possible. Have your preschooler like on her back. Direct her to quickly coil into a ball with her hands encircling her knees Have her return to a supine position. Have her roll around in this ball position. Have your child pretend he is an airplane taking of for flight. Have him lie on his stomach with his arms and hands out to each side as airplane wings. Have him raise his chest and legs of the floor and arch his back. Have your child kneel on her hands and knees. Ask her to pretend she is an angry cat and arch her back as a cat does (Backbone curving upwards). Next, have her pretend she is a happy, relaxed cat and let the stomach curve downward. Have your preschooler stand with his feet astride stretching arms forward and upward gradually raising up on his toes in his attempt to stretch and reach for the moon. Have your child get in a squatting position placing her hands on her head. As you say the following rhyme, on the last line, your child springs into the air stretching her body from her fingertips to her toes. Have your child lie on the floor on his back with arms above his head and legs together. Have him roll like a log across the rug. How’d that go? Did you demonstrate the actions by getting down on the floor too? Good! 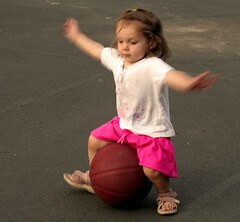 I’ll have more physical activities for your preschooler next week!